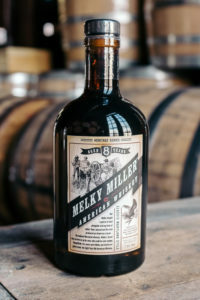 Melky Miller Rye Whiskey was produced at the M.J. Miller’s Sons Distillery just outside the village of Accident, Maryland until Prohibition. The ruins of the abandoned distillery stood for decades until destroyed by fires in the 1970s and ’90s. In the late 1800s Melchior J. (Melky) Miller purchased a farm along a tributary of South Branch Bear Creek, just southeast of Accident. He also bought out the rather crude equipment of a small distillery from Joel Miller, in the Cove area of Garrett County, and moved it to his farm. According to Mary Miller Strauss’ 1986 history of Accident, when the Melky Miller Distillery was in full operation there were always eight hundred to one thousand barrels of rye whiskey aging in the warehouses. The passage of the Volstead Act in 1919 brought the family business to a close. In 1920 all of the bonded stock in the Accident warehouses was transferred to government concentration warehouse in Cumberland. The distillery itself was closed and left to decay. Our Melky Miller American Whiskey is 100% corn, produced and aged in the U.S. at least eight years in reused charred American oak cooperage. We hand bottle it right here at the distillery at 90 proof. This medium body whiskey has mature floral and semi-sweet vanilla notes and a finish with hints of honeycomb, caramel corn and mineral notes.